- de Oost-Vlaamse Unie voor fotografie , de l' O.V.U. - De Koninklijke Antwerpse Verbroedering van Fotokringen - de l' K.A.V.F. This photograph has been awarded the "Special Prize", Bronze Medal at the the 46-th BENELUX Photo Salon 2011. Will be exhibited at the 46-th BENELUX Photo Salon 2011. I cannot say how happy I am about the result, especially that this "Fotosalon" was one of the best I have seen. 16-time Grammy nominee and 3-time Grammy winner, Larry Carlton is perhaps the most versatile and accomplished guitarist walking the planet today. With over 3,000 sessions, 200 hit records and 100 gold albums to his credit, Carlton has his fingerprints indelibly imprinted on virtually every genre of music. 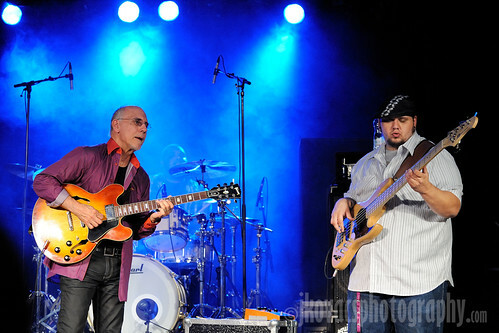 Larry performed in Luxembourg on 9-July 2011, together with Travis Carlton and Gene Coye. An extensive coverage of the event and high resolution files can be found on my website or some of them on my Flick page.